To Charity Mayfield's shock, she discovered a year after her father's death that his debts could mean losing her home. Only by marriage could she touch her inheritance and save Hazelhurst. The only sensible candidate would be Edward, newly come into the Earldom, and the Mayfields' neighbour, so impetuously Charity wrote to propose! Author's note: this book was originally published under the name of Alice Thornton. 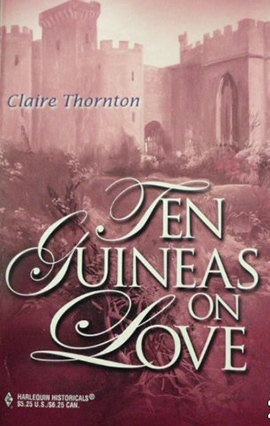 The current edition is published under the name of Claire Thornton. Charity burst impetuously through the library door. “Edward! I’m so pleased you could…” she stopped short. The tall man standing by the window was not Edward Riversleigh. Edward could never have appeared so casually elegant, nor could he have imposed his presence on a room so completely that his surroundings faded into insignificance. Yet the stranger had done nothing dramatic, he had simply turned at the sound of the opening door and looked at Charity; but, as her eyes met his, she was instantly aware that he possessed an aura of strength and sophistication which seemed quite out of place in the small, comfortably shabby library. “I…I beg your pardon, sir,” she stammered, dazedly wondering how the footman could possibly have mistaken this man for the far from grand Edward. “I was expecting someone else. How…how do you do? May I help you?” she finished rather breathlessly. He came towards her as he spoke and as the light from the window fell on his face she could see that he had grey eyes, a firm chin and a decisive mouth. He halted before her and bowed courteously over the hand she instinctively offered him. “You… you should?” Charity said, still somewhat confused by his presence, and disconcertingly aware of the firm clasp of his fingers on hers. “Certainly.” The gentleman straightened up and released her hand. His expression was grave, but there was a distinct glint of amusement in his grey eyes as he looked at Charity, thought she was far too bewildered to notice it. “I believe I have the honour of addressing Miss Mayfield… Miss Charity Mayfield?” he said, his eyebrow lifting enquiringly as he spoke. “Jack Riversleigh?” Charity echoed, staring up at him blankly. “Oh!” Charity gazed, open-mouthed, at her unexpected visitor, still so stunned that it was several minutes before she understood the significance of what he had said. “You mean you come before Edward in the succession?” she said at last. “I’m afraid so,” he agreed. “But I thought Richard died in disgrace years ago!” Charity burst out, losing some of her awe in her amazement at this remarkable turn of events. “Oh, how dreadful!” Charity put her hands to her burning cheeks and closed her eyes, not really listening to what he was saying as she realised with horror that she had proposed marriage to a stranger! “No, no, I’m all right,” she said mechanically. Her thoughts were in such a turmoil of confusion and embarrassment that she hardly knew what to say-or do-but almost instinctively she sought refuge in her role as hostess. Charity looked at him doubtfully. Then she smiled hesitantly. Now that her first shock was receding she could see that the strength in his face was tempered by humour, and she began to feel slightly more at ease with him. She thought that perhaps it was his fine black coat which had made him seem so grand—and then realised almost immediately that he must be in mourning for his grandfather. She felt relieved to have discovered the reason for her unexpected lack of composure earlier, and instantly resolved never to be impressed by fine clothes again. Then, just as she was about to make a polite comment on the weather, or the state of the roads, or some other bland, innocuous topic—to indicate her own level of unconcern and sophistication—it suddenly dawned on her that he was finding the situation amusing, and she began to feel flustered all over again. She raised startled and rather alarmed eyes to his—and then began to feel more comfortable as she realised that, although he was certainly amused, he was equally definitely not gloating over her discomfiture. She even thought she detected a gleam of sympathy in his expression. “Oh, yes!” said Charity, leaning forward eagerly and momentarily forgetting her embarrassment in her desire to find out just how it had come about that Riversleigh had been inherited by a complete stranger. “Oh, I beg your pardon.” She blushed again as she suddenly remembered all her mother’s lectures on decorum. Jack smiled. He had been slightly concerned by Charity’s earlier evident confusion, but now that she had regained much of her composure his amusement at the situation in which he found himself had revived, though he was careful not to show it too openly. “How inhuman!” Charity gasped, her eyes fixed on Jack’s face, her dark curls dancing with indignation. “I never liked him! He behaved most unkindly to Edward for no good reason at all. Was there any reason for him to dislike you papa? Oh, dear! I mean… I mean…” She floundered to a halt, uncomfortably aware that once again she had allowed her tongue to run away with her. “Did he know you existed?” Charity asked curiously. The workings of the late Lord Riversleigh’s mind had always been a mystery to her; she had never understood how he could be so cruel to those who should be closest to him. In her first amazement she had not considered how Edward must feel about the whole thing, but now she felt sad that once more he had been unlucky. She stood up and walked over to the window, looking out at the holly tree that stood up against the blue sky beyond. She swung round to face Jack as she suddenly realised that, interesting though all of this was, she still didn’t have the one piece of information which was essential for the success of her plans. “I’m afraid he’s already on his way to Italy,” Jack said quietly, watching Charity’s face carefully as he spoke. He suspected that this news would be a great disappointment to her and, though he was not above being amused by the situation, he was reluctant to give her tidings which he was afraid would cause her real distress. “You mean, someone’s going to help him in his efforts to become an architect?” Charity asked incredulously. “I hope so,” said Jack, relieved at Charity’s reaction. “I’ve read it,” said Jack apologetically. “Of course. What is it?” Charity glanced at him apprehensively, suddenly reminded that he had read her letter and consequently knew far more about her than she might have wished. “Are you very disappointed by the turn of events?” he asked. “As I’m sure you’ve realised, I’m afraid I read your letter. I must apologise for that—I don’t make a habit of reading other people’s correspondence, and I assure you I will treat what I read in confidence but at first I didn’t quite know what to make of it.” He paused. “No, I understand,” said Charity; she looked down at her hands, feeling very self-conscious. “You mean, you’re going to ask someone else to marry you?” Jack had been leaning back negligently in his chair, but he sat up straight at this. Unfortunately, this title is not currently avaiable as an ebook in the UK. Cover Copyright © 2003 by Harlequin Mills & Boon Limited. ® and ™ are trademarks of the publisher.